A mum whose baby bump pictures went viral has shared her experience of post-baby body after giving birth to triplets. 36-year-old Maria shared pictures of her growing bump on Instagram, as many excited mothers often do, but Maria’s belly really was a sight to behold. Ouch. That cannot have been comfortable. 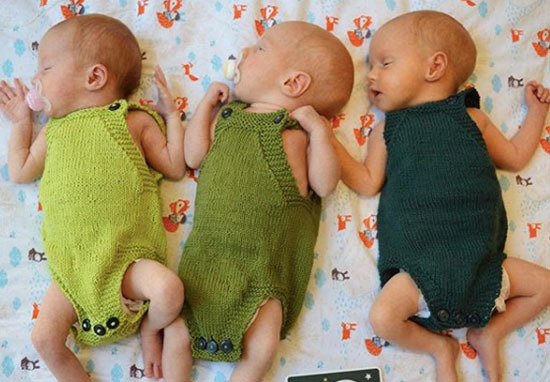 The three babies popped out into the real world in September, and since the birth the mother has been sharing lots of adorable pictures of Iben, Agnes, and Filip. Of course, after having her stomach stretch out as much as Maria’s did, it’s going to take some time to shrink down again. The mother has been explaining the experiences she’s been having with her post-baby body, documenting the struggles of life after birth. Vent warning. What a woman needs to go through! Day 4 and it has been quite a ride body wise. The first two days I could barely stand up because of extreme pain in the c-section wound, but the nurses made me walk a bit anyway. If I didn’t, it would become even worse, they told me. In addition to that it has been three days with my bowels constantly twisting and turning like snakes (you wont believe the sight of it! ), causing much pain. And to top it off my milk started coming in already yesterday, and has caused huge and very painful breast engorgement. My nurse actually asked if I have implants! The joke of the day. She also documented the disappearance of her belly just as she did its growth, explaining it was taking longer for her uterus to shrink because the triplets had stretched her torso so much. Maria is currently four weeks postpartum, and it usually takes around six to eight weeks for the uterus to return to its normal size after pregnancy. One week after the birth of my triplets. I now have a really weird looking hanging belly, which is still quite heavy. My uterus has not shrunk back yet. Last week she shared another update on the progress of her body where she admitted she wasn’t happy with the lack of change, but she remained optimistic. I still have a weird looking hanging belly, and I am a bit surprised it has not gotten smaller since my last picture three weeks ago. Kind of disappointing I must admit, and I am not too happy to share this picture. On the positive side the c-section scar doesn’t hurt anymore, and in the last two days I’ve almost felt like myself again! Except for this heavy sagging belly that is. Though Maria was disappointed with her body in the picture, her followers were quick to offer their support and praise. You have done the most amazing, beautiful and fantastic thing in the world that no man can ever do! You are absolutely beautiful in every way!!!! YOU ARE AMAZING! And your body is amazing and beautiful and I send so much respect and love your way mama! Maria is definitely an inspiration to any mothers-to-be out there!